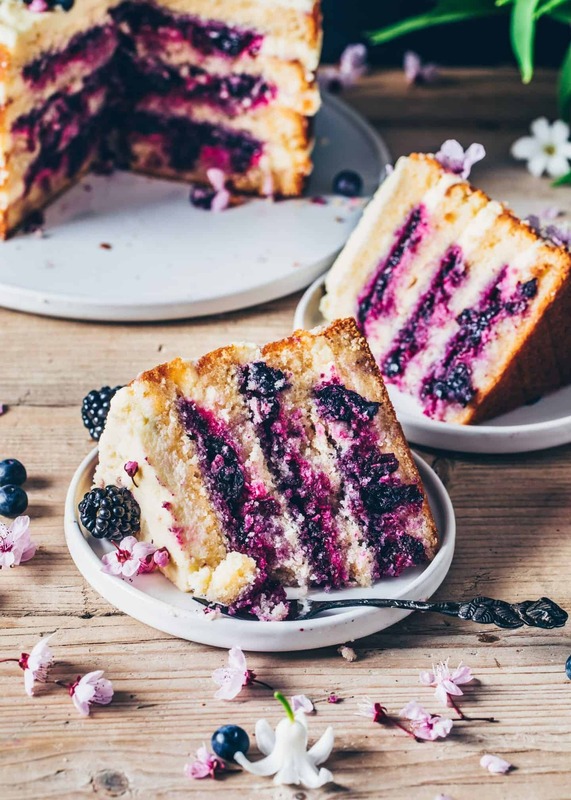 This Lemon Blueberry Cake is a soft, moist, and totally delicious! 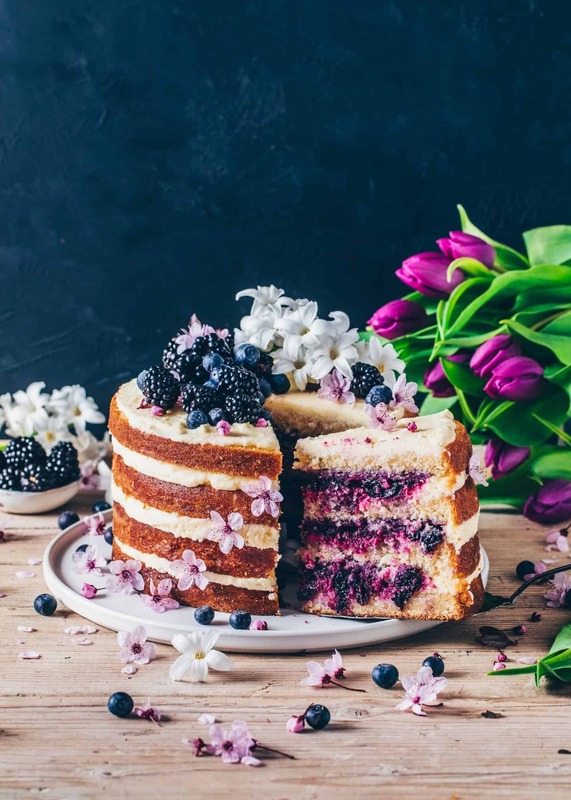 It is layered with a creamy lemon frosting and a sweet blueberry filling, making it a perfect dessert for Easter or anytime you want a vegan layer cake! Who says vegan cakes can’t be fluffy, moist and delicious? Well, I can confidently say they can!! If you’ve been following me for a while you may have noticed that I love baking vegan cakes. Whether it’s a loaf, sponge cake, bundt cake, round cake, layered cake or whatever cake, haha! In fact, there’s no kind of cake I don‘t want to veganize! Honestly, it even makes it fun for me, I love experimenting in the kitchen. And when my experiments succeed, my neighbors are happy because they can enjoy it! 😃 Even though they’re not vegan, they often don’t notice that it’s egg-free and dairy-free. 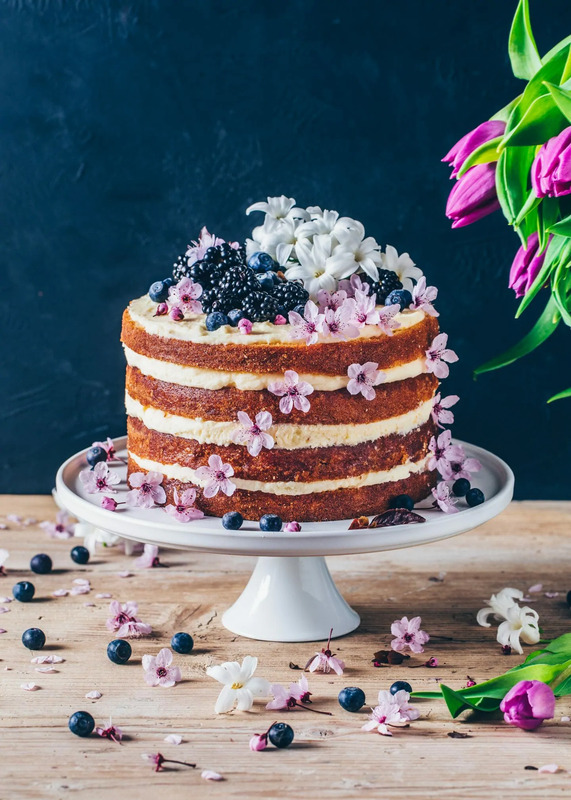 Since my blueberry bundt cake with lemon flavor is so delicious, I wanted to make a similar cake but with a fruity and creamy filling. Also, I wanted to modify my lemon cake recipe, making it moister and juicier. So I came up with the idea to bake a vegan layer cake which has all the layers and flavors I love! Let’s start with the moist and fluffy vegan lemon cake! Actually, it’s super easy to make because the batter comes together very quickly and there are only a few simple ingredients required. I recommend using all-purpose flour because it makes the fluffiest texture. However, if you want to make the cake gluten-free, you can substitute a good gluten-free flour blend 1:1. Secondly, please make sure not to overmix the batter or your blueberry lemon cake will get dense. It’s best to mix everything together just until combined! Of course, you can simply use store-bought blueberry compote or jam for the filling. But let’s be honest, anything that’s homemade is definitely better, right?! 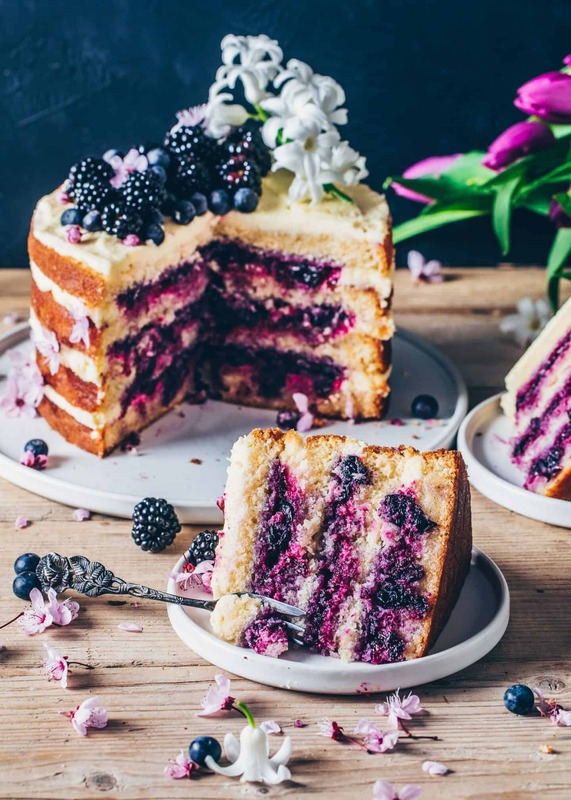 And don’t worry, this juicy blueberry filling is also very easy to make with only 3 ingredients. Simply stir together the blueberries, sugar, and lemon juice in a pot and bring to a boil. Cook over medium heat until the sauce has thickened up, which is about 8 minutes. Oh, and please don’t forget to stir constantly to avoid burning. Then mash it a bit and set aside to cool completely. Also, the creamy frosting is mixed together super quick. But before you start, please make sure that your ingredients are room temperature. Otherwise, the vegan butter and cream cheese won’t blend very well, resulting in a non-creamy frosting. To make the lemon cream, simply mix the vegan butter until creamy. Then add the cream cheese and mix again. Lastly, sift in powdered sugar and add a squeeze of lemon juice and mix again until super creamy and well combined! If it’s still too soft, you can add more powdered sugar. And if it is too firm, you can add more lemon juice. 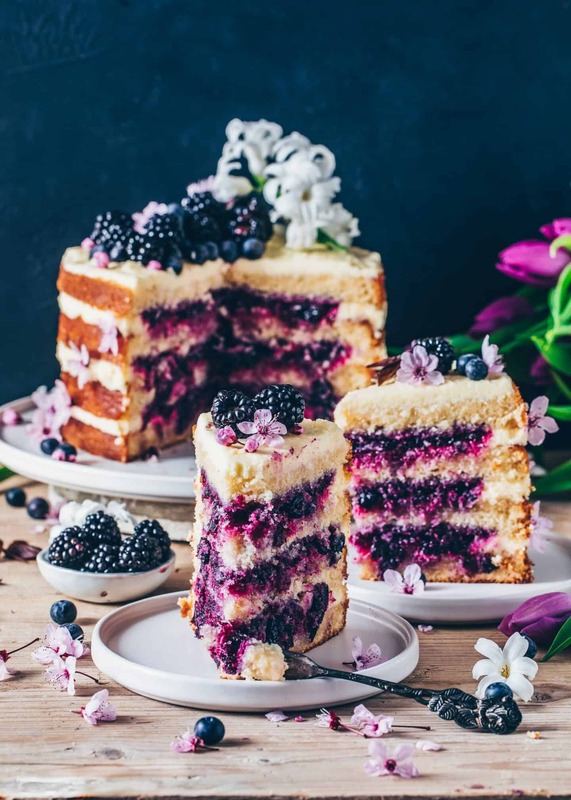 When baking the Lemon Blueberry Cake, please check the baking time and temperature because I figured out that ovens often vary. 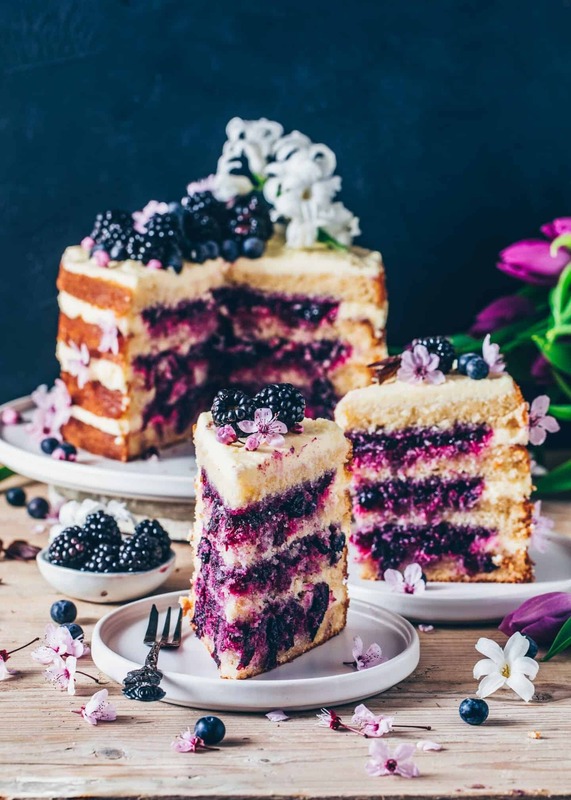 This means, if the temperature of your oven is too low, your cake may not rise very well and will need longer until baked through. 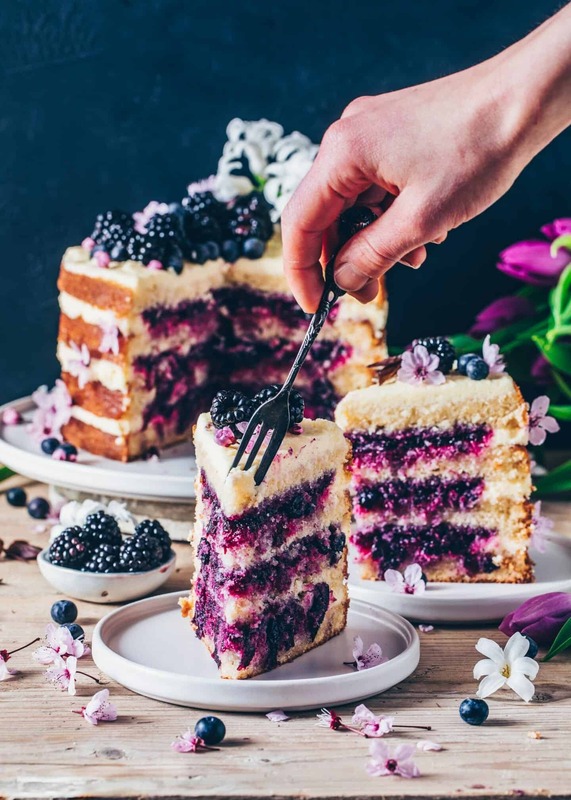 And if the temperature is too high, your cake may get crumbly and dry on the outer sides quickly while it is still wet inside. Please make a cake test! I always recommend doing a cake test to check if your cake is ready. When you insert a toothpick into the middle of your cake, it should come out almost clean. When I say almost, I mean it’s totally fine if there a still a few crumbs because when it’s completely clean your cake will be too dry. Perfect for Easter or any occasion! I love to decorate my cakes with anything I can find! Often, I make pipes on top of the layer cake with the remaining frosting and sprinkle over chopped chocolate. Also, I love using fruit, such as cherries, blackberries, blueberries or other berries. Anyways, this time I was in the mood to decorate it with flowers too because since spring started, I‘m so in love with these beauties! Choose the decorations you like, and feel free to decorate your cake however you like. 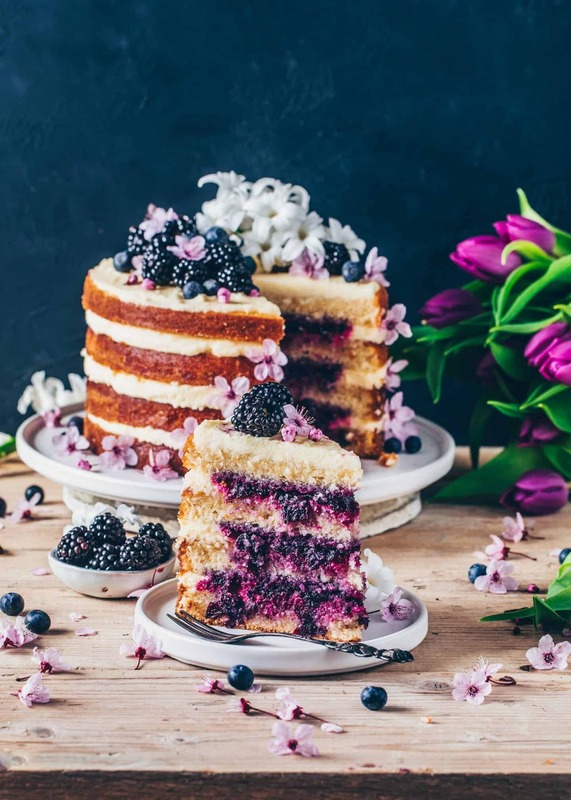 If you try this Vegan Lemon Blueberry Cake Recipe or maybe another of my Vegan Cake Recipes, please leave me a comment below sharing how it turned out for you! 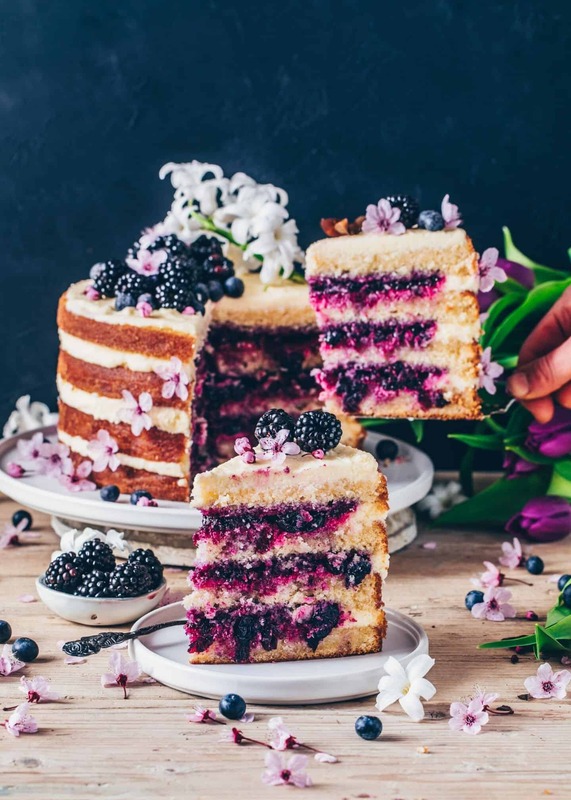 I’m pretty sure you’ll also like my fluffy Vegan Vanilla Cake or my Blueberry Bundt Cake. But also, my Blueberry Crumble Cheesecake or my Blueberry Babka are both very delicious. 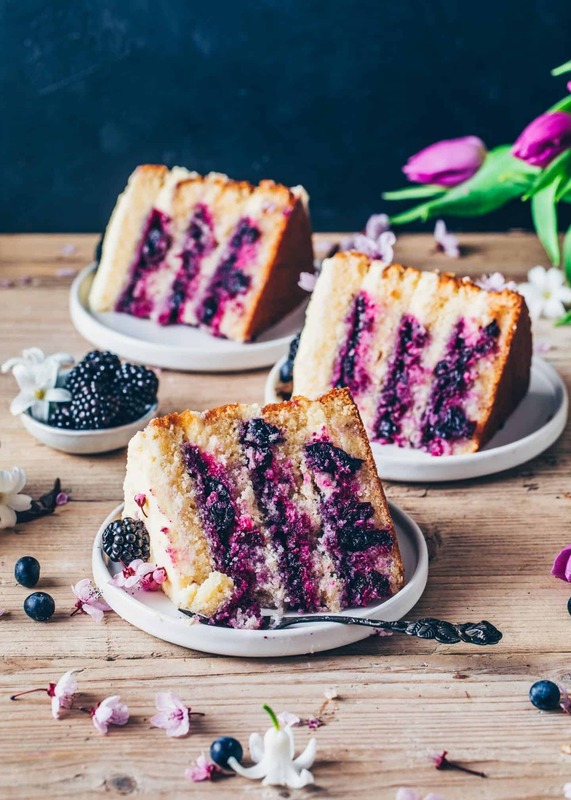 This vegan Lemon Blueberry Cake is soft, moist, and totally delicious! 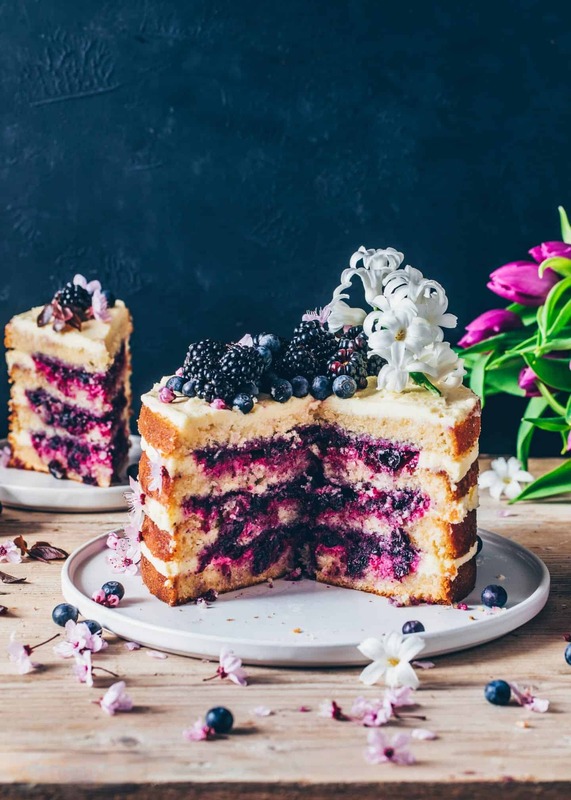 It is layered with a creamy lemon frosting and a sweet blueberry filling, making it a perfect dessert for Easter or anytime you want a fruity layer cake! Combine non-dairy milk with lemon juice and set aside until it curdles to create vegan buttermilk. In a large bowl whisk together flour, baking powder, baking soda, sugar, and salt. Stir the oil, vanilla and lemon zest into the vegan buttermilk. Then pour it into the flour mixture and mix everything just until the ingredients are combined. (Don't overmix or your cakes will be dense). In a pot, combine blueberries, sugar and lemon juice. Bring to a simmer and cook over medium heat until the blueberries are soft and the sauce has thickened up, about 8 minutes, stirring constantly. Let cool afterwards. (The best is to let it chill in the fridge overnight, so it can thicken up more). In a large mixing bowl, mix the vegan butter with a handheld mixer until creamy. Then add the cream cheese and mix again. Lastly, sift in powdered sugar and a squeeze of lemon juice and mix again until creamy and well combined. (If it’s too firm and not spreadable, stir in more lemon juice. If it is too soft, add more powdered sugar). 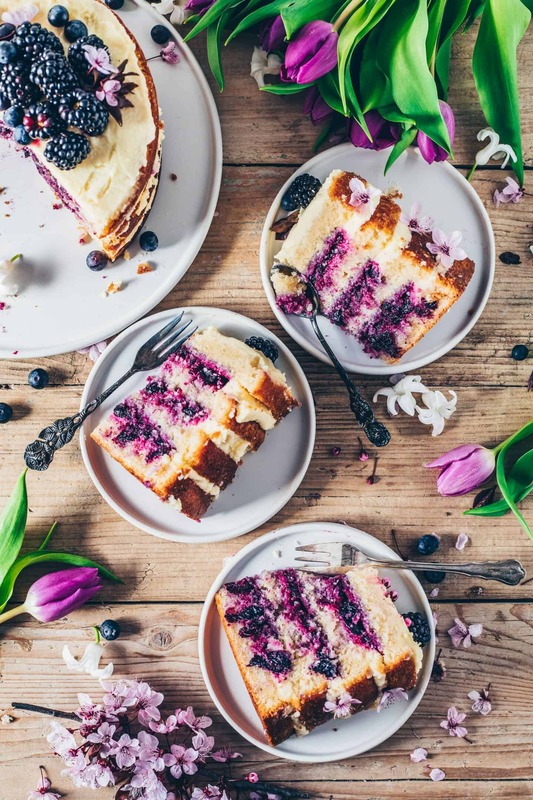 Cut each cake horizontally in two equal layers. 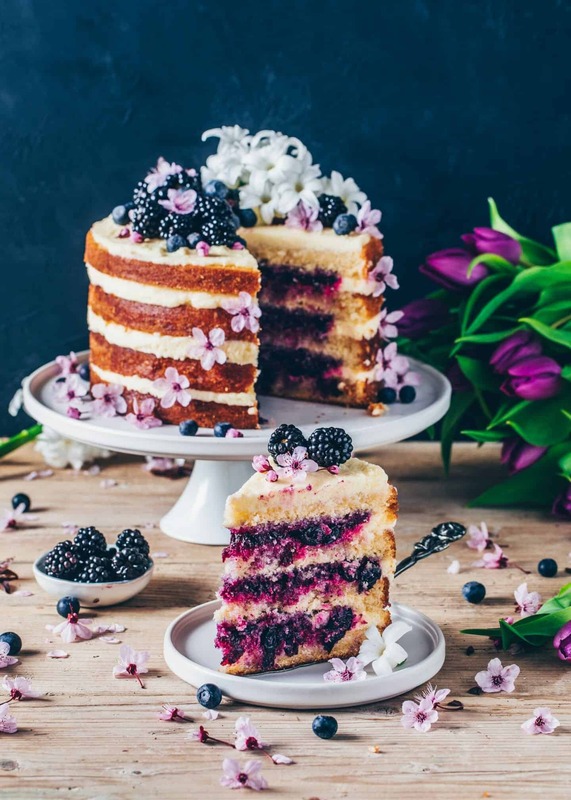 Place one cake layer on a serving plate. Spread about 1/4 of the lemon frosting over the cake so that it’s higher around the edges (to hold the blueberry filling inside). Then spread 1/3 of the blueberry filling inside. Top with the next layer, another 1/4 of the frosting, followed by another 1/3 of blueberry filling and repeat for the third layer. Place the fourth layer on top and spread the remaining lemon frosting over it. Place a cake ring around and chill about 3-4 hours in the fridge before decorating and serving. To make this cake gluten-free, I recommend using a gluten-free flour blend 1:1. Instead of cream cheese, you can use coconut cream. Simply refrigerate a can of coconut milk overnight. Then scoop out the solid part from the can which should have the same consistency as cream cheese (this is the coconut cream). If you don’t want to make the blueberry filling, you can use store-bought blueberry compote or jam. Or just fold some blueberries tossed in a bit of flour into the batter. Also, other kinds of berries are fine. 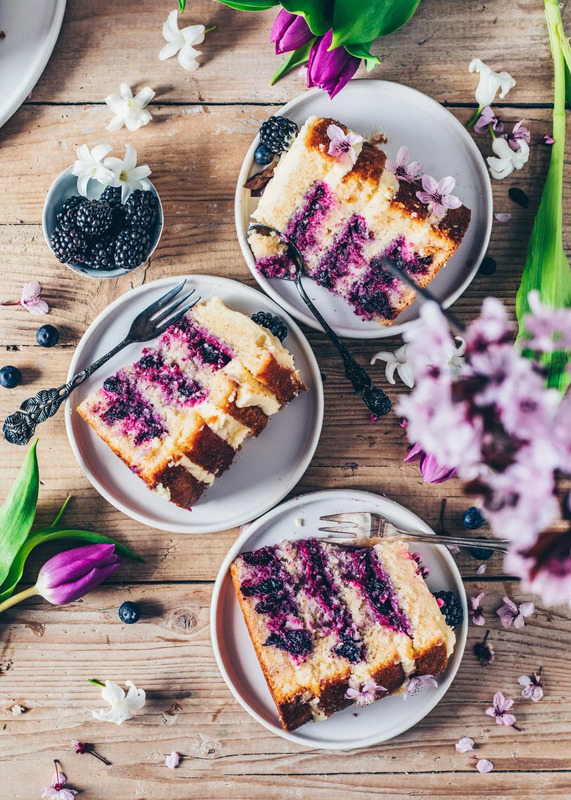 You can store leftover cake covered in the fridge, for up to 4 days, or freeze the un-frosted cake. If you want to make cupcakes from the batter, bake for 20-25 minutes. Please read the text for further information. 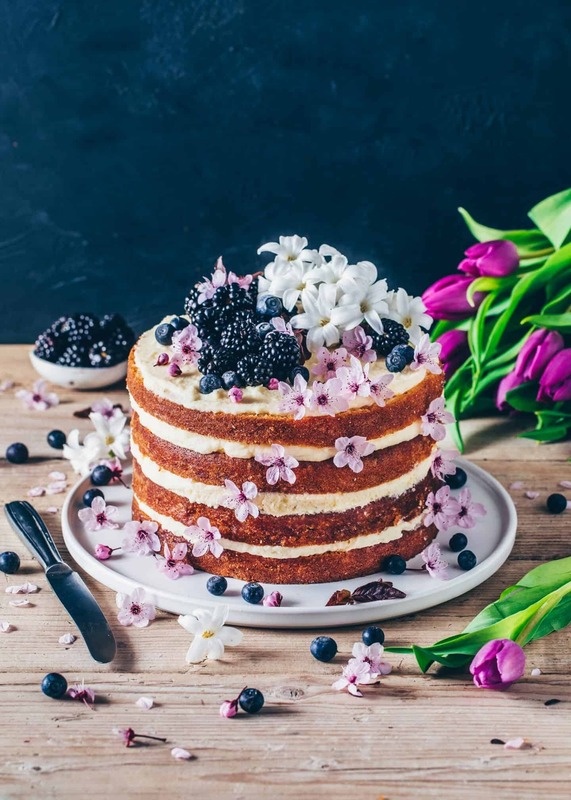 I love the look of this stunning cake Bianca! That would be perfect centrepiece for an Easter table! Hi! This really looks delicious! But I have a question: cream cheese is not vegan right? Or am I totally wrong? Woud love to hear from you! 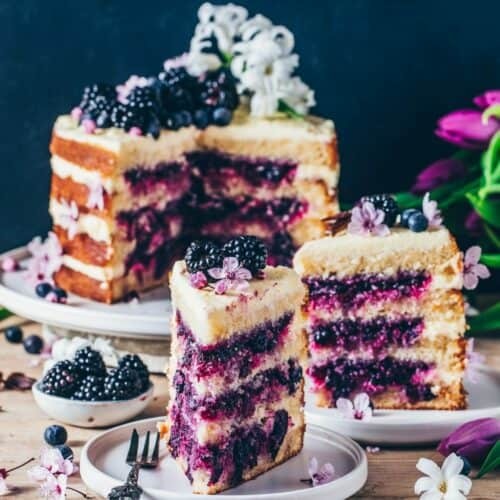 Your recipes are just absolutely stunning, Bianca!! This cake is out of this world! Which kind of vegan butter and vegan cream cheese did you use? I did this cake for my 24 birthday and It was the best cake i’ve ever had!! Soft, not too sweet, cruelty free and delicious! I need to improve my skills but I will make it again for sure!! I liked this recipe but the cakes I don’t believe are big enough to cut in half and have it look as pictures. Would be better off to cut of the tops and use this recipe for a two layer cake.